Ohio State quarterback Dwayne Haskins leads a prolific passing attack. 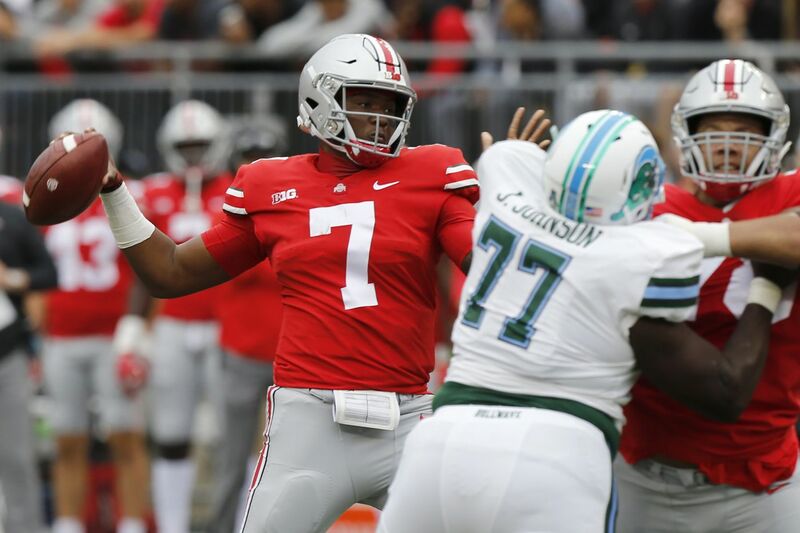 Ohio State has changed its offense to a more pro-style attack that has featured the passing of redshirt sophomore quarterback Dwayne Haskins, and its success is revealed in the numbers. The fourth-ranked Buckeyes are second in the nation to Penn State — their opponent on Saturday night at Beaver Stadium — in scoring at 54.5 points per game, and are third in total offense with a 599.0-yard average. With Haskins completing more than 75 percent of his passes for 1,194 yards and 16 touchdowns, Ohio State is sixth in FBS passing offense. It's a different style from what the Buckeyes ran for four years under dual-threat quarterback J.T. Barrett, who went 3-1 in his career against Penn State. Haskins has thrown 115 passes and has rushed but 10 times. "It's not the same offense," Ohio State coach Urban Meyer said Monday at his weekly news conference. "It's a very different offense right now. One was a run-first, pass-second; this one is a do-what-they-give-you. I don't think we've ever had a team average over 300 yards passing a game, either." Meyer credited his offensive coordinators, Ryan Day and Kevin Wilson, with effectively using the skill sets of the team's offensive personnel. "You don't go out and recruit cookie-cutter players," he said. "You go out and recruit the best player you can. When we recruited Dwayne, he had a very good skill set. So it's our job as coaches to adapt." Haskins completed 21 of 24 passes Saturday for 304 yards and five touchdowns — all in the first half — in a 49-6 win over Tulane. The Buckeyes have an experienced receiving corps led by senior Parris Campbell, who has 19 catches with team highs of 299 receiving yards and five touchdowns. Meyer said he doesn't see much difference in Penn State considering the Nittany Lions lost players such as running back Saquon Barkley and tight end Mike Gesicki from last year's team. He called quarterback Trace McSorley "a winner, a guy that can do it all, and a competitor." Meyer calls the atmosphere at Beaver Stadium "one of the tops in the country." In the 2016 "Whiteout" game, the Lions, fueled by Marcus Allen's block of a field goal that was returned 60 yards for a touchdown by Grant Haley, defeated the Buckeyes, 24-21, and went on to win the Big Ten championship. "It's just a difficult place," Meyer said. "It's certainly one of the top five stadiums that's hard to play in, very loud. The fans are into it, very good environment, great environment." Meyer said all-America defensive end Nick Bosa will miss the game while he recovers from surgery to repair a core muscle injury. Junior running back Miles Sanders, who rushed for career highs of 200 yards and three touchdowns in the Nittany Lions' 63-24 rout of Illinois on Friday night, was named co-offensive player of the week in the Big Ten. Sanders, who ranks seventh in FBS with 123.8 rushing yards per game, shared the honor with Haskins. ESPN's popular College GameDay will be telecast live from the Penn State campus on Saturday. It marks the seventh time — and second consecutive year — that the show will originate from Happy Valley, and the 18th time overall that the program has been at the site of a Nittany Lions game.